‘Surely, they have disbelieved who say: “Allaah is the Messiah [‘Iesa (Jesus)], son of Maryam (Mary).” But the Messiah [‘Iesa (Jesus)] said: “O Children of Israel! Worship Allaah, my Lord and your Lord.” Verily, whosoever sets up partners in worship with Allaah, then Allaah has forbidden Paradise for him, and the Fire will be his abode. And for the (polytheists and wrong doers) there are no helpers.’ ‘Surely, disbelievers are those who said: “Allaah is the third of the three (in a Trinity).” But there is no ilaah (god) (none who has the right to be worshipped) but One Ilaah (God -Allaah). And if they cease not from what they say, verily, a painful torment will befall the disbelievers among them.’ Will they not repent to Allaah and ask His Forgiveness? For Allaah is Oft-Forgiving, Most Merciful. Amongst them [i.e. the Rawaafid] are those who say that their Imaams will return after death; and from them are those who claim that some of their Imaams are infallible; and amongst them are those who say that Ali [radiyallaahu-anhu] can bring back the dead to life; and amongst them is one who says that he walks on the sea.. Ali, Hasan, Husain Muhammad Bin Hanafiyyah, Ali Bin Husain, Hasan Bin Hasan, Muhammad Bin Ali Bin Husain, Jafar Bin Muhammad, Zaid Bin Ali and those who follow their path from the family of the Prophet free themselves from these false [claims] and its proponents. 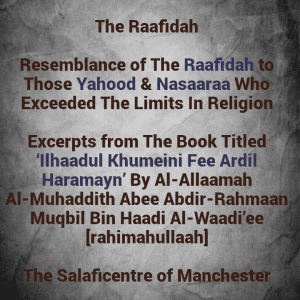 And know that the Raafidah were not called Raafidah except from that time they rejected Zaid Bin Ali; however, the path of the Raafidah is that of their predecessor Abdullaah Bin Sabah and those who followed his path of deafness, dumbness and blindness – those who do not possess understanding. Reference 1: Shaikh Muqbil (rahimahullaah) says that this athar [narration] is authentic based on the conditions applied by Bukhaari and Muslim when declaring narrations authentic. A description of the rightly guided believers. An exhortation to not be deceived by ones own actions or knowledge. And an elucidation of why some people are provided with certain blessings by Allāh. Disbelief, which exits a person from the religion. Wickedness, which does not remove a person from the religion, however it decreases ēmān, such as the major sins which are lesser than shirk, this is (what is intended by) wickedness. Disobedience; these are the rest of the prohibited affairs which do not reach the level of a major sin. Firstly, disbelief is hated to them, due to their ēmān being firm and established. Secondly, wickedness is hated to them, because of this they do not commit major sins, the likes of drinking alcohol, fornication, stealing e.t.c. Thirdly, disobedience is hated to them, as a result of this they do not oppose the prohibitions (which are established from the sunnah of Allāh’s Messenger (sallallāhu alaihi wa salam)). When it reaches them that the prophet (sallallāhu alaihi wa salam) forbade something, they stay far away from it and they are not tempted to carry it out ever. This is because they hate it, since Allāh has placed in their hearts dislike for it. These! They are the rightly guided ones. Meaning those who are described with the aforementioned characteristics in the verse. They are the rightly guided ones. And being rightly guided is in opposition to being upon misguidance. This which has transpired for the rightly guided (of guidance and praiseworthy characteristics), has only occurred due to the Favour and Grace of Allāh, not due to their own power or strength. Indeed it is only due to Allāh who has given them success. This (verse) has within it a reminder that a person shouldn’t be deceived with what he has from religion, knowledge or acts of worship. Instead, he thanks Allah for His blessings upon him (verbally with the tongue and physically with his limbs by using these blessings in the obedience of Allah), and he acknowledges (with his heart) that this is a favour from Allah bestowed upon him. Allāh is All-Knowing of who is deserving of this grace and blessing. He is the All-Wise, meaning he places affairs in their appropriate places, therefore he does not bestow this grace and blessing upon those who do not deserve it, verily He only bestows it upon those who are befitting of it. Magic was counted among the (seven) destructive sins, and came (directly) after joining others in worship (shirk) with Allah (azza wa jal). Magic is disbelief, because Allah (subhaanahu wa ta’aala) mentioned about the Jews that they exchanged the book of Allah with magic. Therefore, magic is from the actions of the devils and it is disbelief. So, (the ayah) shows that teaching magic is disbelief. Meaning they have no portion (of rewards and delights of Jannah). So, this shows that the magician if he does not repent to Allah, then he has no portion in the hereafter (Jannah), and this is the disbeliever. Magic is disbelief and based upon this prayer behind a magician is impermissible, except if he repents to Allah (subhaanahu wa ta’aala) and abandons magic and repents with a correct repentance, and whoever believes in magic (even if he doesn’t perform it himself) … then this is his ruling too (i.e. 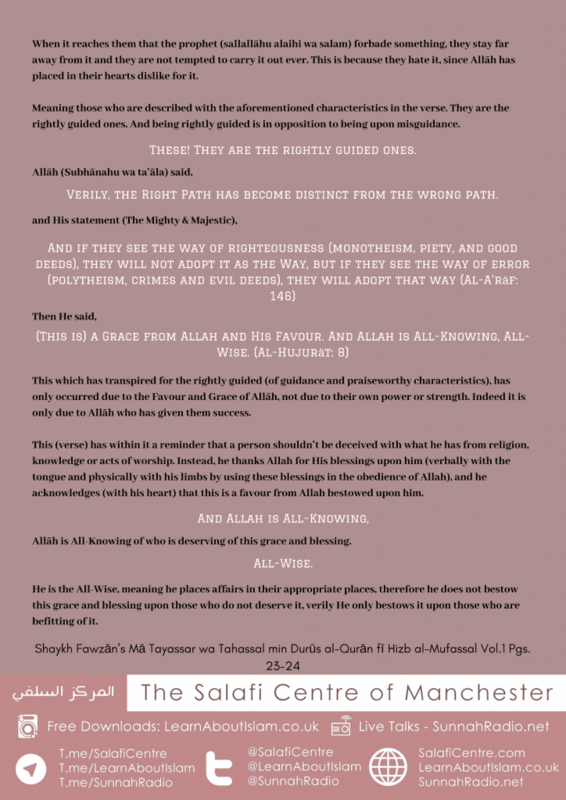 that he is a disbeliever just as the magician is), and refuge is sought with Allah. 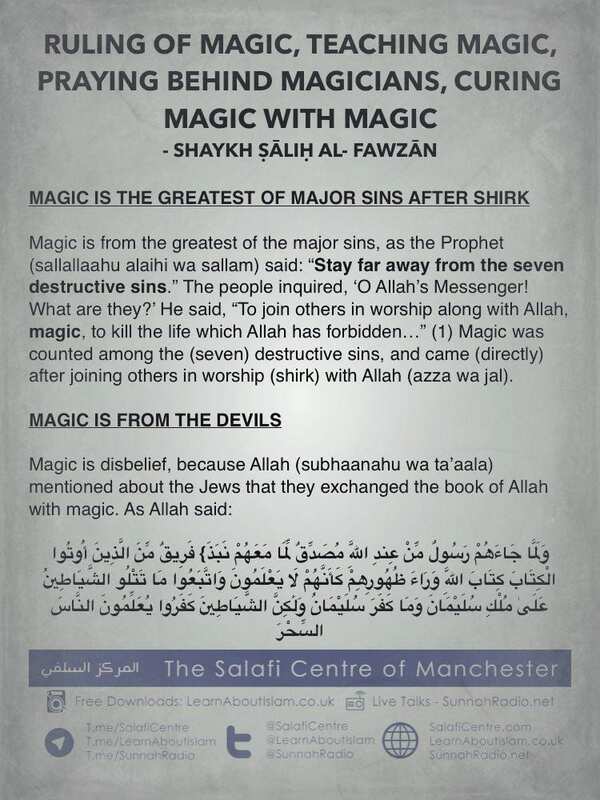 Magic is the greatest of the major sins after shirk, it is disbelief in Allah (azza wa jal), it is the partner crime which has been mentioned alongside shirk with Allah because it is disbelief in Allah (azza wa jal), as Allah has mentioned in His Noble Book, so the magician and the one who believes in magic, both are the same (in ruling). 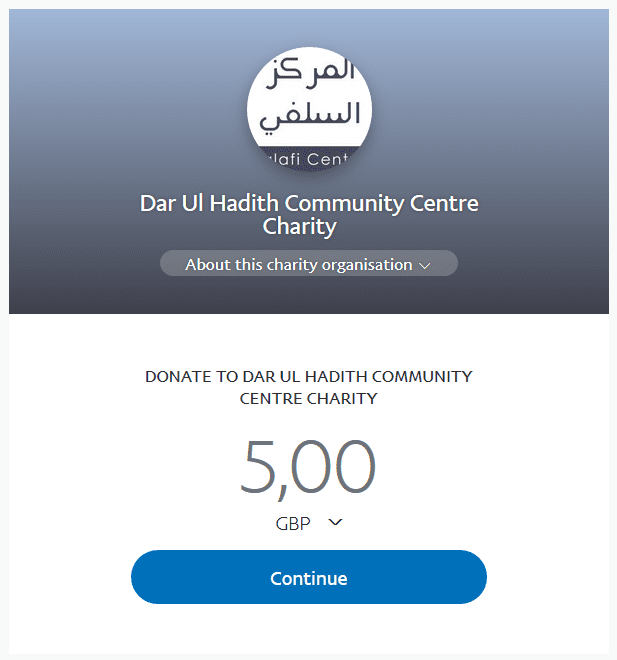 As for the issue of curing magic with magic and its likes (from the other affairs which are haram), then that which is correct from the two positions of the Scholars is that it is not permissible, because curing is only (allowed) with that which is Halaal (permissible) or Mubaah (allowed), and Allah did not place a cure (for) the Muslims in that which He has made impermissible for them. And from the greatest of impermissible affairs is magic, so it is not permissible to treat illnesses with it, nor to undo magic with magic. Indeed magic is only cured with permissible medicine, Quranic verses, (authentically) transmitted supplications. These are the permissible ways with which magic is cured -permissible medicine, supplications and Quraanic verses, and this suffices the Muslim. Subheadings are by the Translator for ease of reading. Does disbelief have many types and levels, some of them more severe than others? Or is it one level? And if there are levels of disbelief, then which of them constitutes cursing of the religion, or Allah, or the Messenger (sallallaahu alaihi wa sallam), and refuge is sought with Allah from that? Yes, Disbelief, – refuge is sought with Allah – is levels, some of them more severe than others, from them is disbelief which exits from the religion, and from them disbelief which is lesser than that: Lesser disbelief. 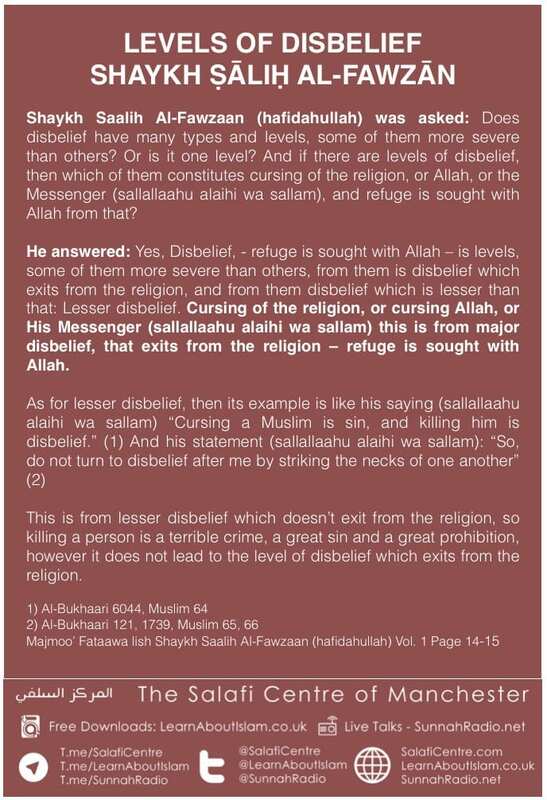 Cursing of the religion, or cursing Allah, or His Messenger (sallallaahu alaihi wa sallam) this is from major disbelief, that exits from the religion – refuge is sought with Allah -. This is from lesser disbelief which doesn’t exit from the religion, so killing a person is a terrible crime, a great sin and a great prohibition, however it does not lead to the level of disbelief which exits from the religion. And nothing prevents their contributions from being accepted from them except that they disbelieved in Allah and His Messenger. Has everyone disbelieved who curses the religion or rejects the sunnah? There is no doubt whatsoever in this; whoever curses the religion or rejects the Sunnah then verily he has disbelieved, because he is a denier and disbeliever in the Sunnah; also he who curses Allah’s religion, which Allah has chosen for his slaves; then he has cursed that which Allah has chosen for his slaves and legislated for them, so this one has cursed Allah -azza wa jal- there is no doubt at all of his disbelief , he who belittles Allah (and attributes deficiencies to him; Glorified and far removed is Allah from all imperfections) . 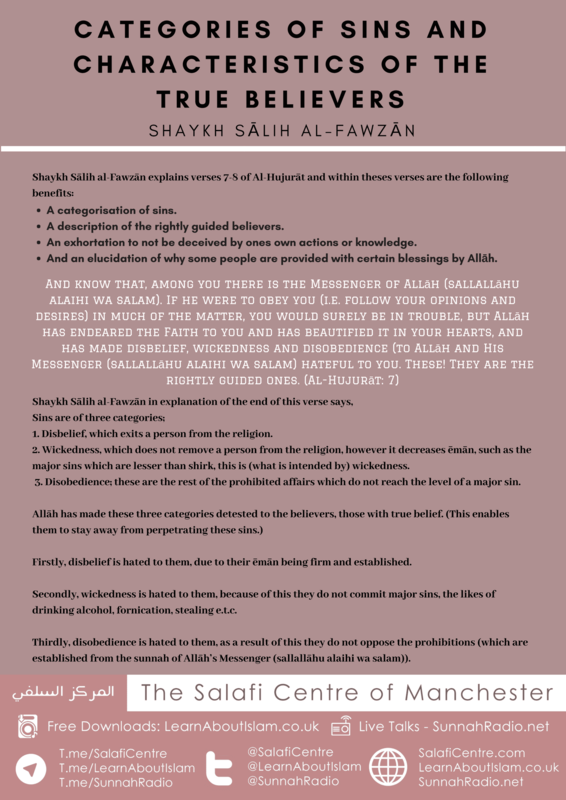 Please note that declaring a specific individual to have disbelieved and left the fold of Islaam is an affair that is to be returned back to the Scholars and it is not for other than them to declare a specific individual to have disbelieved.